City Beautiful Site: Several students this morning – Kelly Henderson, Katy Kaslow, and Alyssa Vorbeck – have been polishing the City Beautiful Omeka exhibit. They’ve added text for the homepage, an historiographic introduction, and conclusions. They’ve made all the exhibits public and the class Omeka website – and our main project for the course is now live. Next fall, we’ll recapture some of the images at higher quality and fix a few exhibits (like the City Votes), but the website represents a (mostly) complete thought. It is the main product of the course and it comes with an introduction, a conclusion, and five exhibits. There are 255 items relevant to Harrisburg’s City Beautiful movement although only the higher quality images have been made public. Check it out here: “Harrisburg: The City Beautiful”. 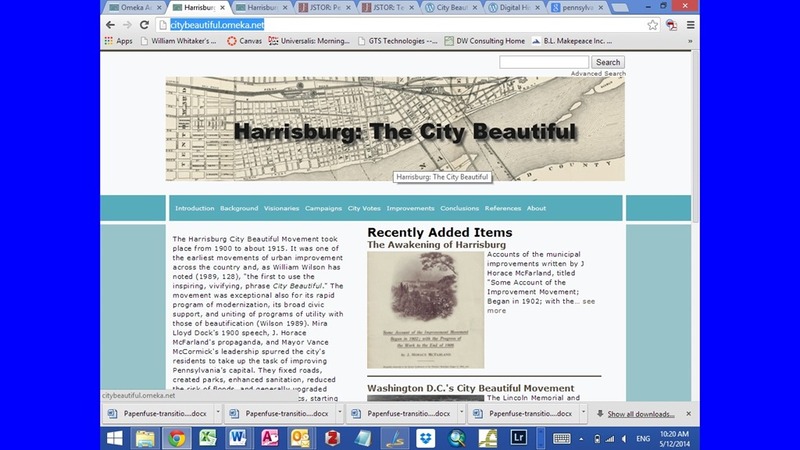 Digital Harrisburg Website: While that group was working on the City Beautiful site, Chris Beardsley, Cassidy Rivera, and Laura Stokes have been adding content to this website in Digital Harrisburg. They’ve used text and images from earlier posts to craft pages for the City Beautiful Project, the City Social Project, and a more detailed overview of the Digital History class that helped to complete these projects. They also added links to websites relevant to Harrisburg’s history and culture and tinkered with the theme headers and site settings to make it more visually pleasing. Wikipedia: Meanwhile, during this exam hour, we’ve also added content to everyone’s favorite online encyclopedia, Wikipedia. Emily Mee, Shane Reed, and Taylor Schock created a Wikipedia page for Harrisburg’s City Beautiful movement, complete with references and images. They’ve added a short paragraph about Harrisburg to the Wikipedia page devoted to the City Beautiful Movement nation-wide. And they’ve added a paragraph about City Beautiful to Wikipedia’s Harrisburg, Pennsylvania page. Process and Video Group: The final group (Rachel Carey, Tyler Stone, and Christina Thomas) had the job of producing a concise 500-1,000 word narrative overview about practicing digital history in a digital age, what students learned from the course, and/or what students did in the class. The goal of this narrative was to produce a concise, well-organized student perspective on digital history, information fluency, and the Digital Harrisburg project. Eventually, we will convert this narrative into a little video about the project. The point of this class, I said on the first day, was for students to become producers of history and also launch a new digital initiative on our campus – while collaborating with other institutions – related to Harrisburg’s history and culture. We end our class with celebration of the successes. David, sorry that I didn’t see your response until 2 months later. Please do look me up on FB or LinkedIn – Robert Shoaff – as it would be good to connect.